A nutritionally complete diet, clean and safe living conditions and pure fresh water are the basics for good Gouldian finch care that will keep them healthy and strong. Since Lady Gouldians consume 30% of their body weight each day, they spend a great deal of their time eating. The Lady Gouldian Finch Diet information included here is for a routine or daily diet. There are really two diets, a daily diet and a breeding or molting diet which consists of additional nutrients and will be covered in the breeding section. These two diets mimic the natural diet of the wild Gouldians. In Australia, the birds enjoy a wet season diet and then a dry season diet. The wet season starts the growth of lots of grasses with bountiful seed heads, weeds and leaves to eat. Sensing that there is surplus food available, enough to provide for their chicks, the birds start preparing to breed. By the time the chicks mature, it’s time for the dry season to begin. This is a period of time when food becomes sparse as there is very little rainfall and the production of vegetation stops. Lady Gouldians have been observed in groups as they search on the ground for the last bits of the fallen seeds. It has been observed from field studies and soil tests that no bugs are found in the soil where Gouldians frequently forage for seed. The protien found in bugs and worms is a very important nutrient for successful breeding and molting. Domesticated Gouldians most often will not eat bugs or worms so protein must be provided by other sources at those times, more about that in the breeding section. A seed diet alone for our caged birds will eventually lead to many nutritional deficits. Every cage should be stocked with a clean cuttlebone, a mineral block and health grit. These items will insure that the birds are being offered all of the minerals their bodies will need, when they need them. Cleanliness cannot be emphasized enough when it comes to Gouldian finch care. Gouldian finch care consists of always providing a quality finch seed mixture that consists primarily of plain canary seed, white proso millet, oat groats and niger seeds. At Flexibleflyers’ Aviary we provided our birds with a variety of small amounts of organically grown, pesticide free fresh fruits and vegetables. It became evident very quickly that our Gouldians did not care for fruit. They would however devour what breeders commonly call, “greens.” These are vegetables having the darkest green leaves, romaine lettuce for example is acceptable for Gouldians where as iceberg lettuce is not. At FFA we found that our birds especially enjoyed chickweed, collard greens, and cabbage , as well as romaine lettuce. In my ebook you will find a comprehensive list of the edible vegetation that is desirable, safe and nutritious to offer Gouldians. Take note and remove any greens not eaten within a few hours. 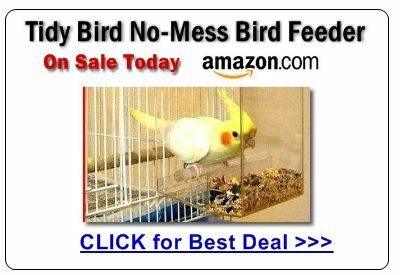 This will assure that your birds won’t go back for seconds from wilted or decomposing plant material. Filtered water or bottled water is preferred to tap water in the U.S. Plastic water bottles or vacuum water bottles, (bottles with ball bearings at the outlet), that hang on the outside of the cage are the easiest to use and do the best job of keeping the water from being fouled with droppings or by bathing birds. All Animals need to have a balanced diet. The six necessary dietary components include proteins, carbohydrates, fats, vitamins, minerals and water. All of these are needed in various amounts at various times in all animals’ lives and our birds are no exception. The daily Lady Gouldian Finch Diet as detailed earlier on this site is not sufficient to sustain the lives of the Lady Gouldian finch chicks and their parents. Some birds will still breed without additional nutrients, but the parents will be depleting their own bodies’ reserves and the eggs will most likely, and hopefully, I shall add, not be fertile. I say, hopefully not fertile, because otherwise, chicks will hatch only to struggle and ultimately die having been deprived of the proper nutrition. A Gouldian finch breeding diet consists of the regular diet as a base. A seed mixture created for finches will be made up of Canary grass seed, white millet, panicum millet, plate millet, Japanese millet and niger seed. While protein sufficient for maintenance, repair and growth is available in a quality finch seed mix and millet sprays, additional proteins are extremely important and must be added when it comes time for successful reproduction to take place. Sources of proteins are found in animals and vegetables and seeds. Always have spray millet available for breeding Gouldians. It is a great source of protein. The Gouldian finch breeding diet must be supplemented with animal protein and the proven best source for our domesticated Gouldians comes from eggs. Dried egg food can be purchased in most large pet stores or bird shops. It comes in packages that contain small dried yellow crumble. There are several different types offered. I have been successful with a product known as Ce-de-eivoer, (egg food), but there are many others to consider as well. My preference is the Ce-de egg food that has added dried insects. This dry mix alone is often ignored by the birds as are the biscuit forms of egg food. A finely chopped hard boiled egg when added to the dry Ce-de mix however makes a very enticing food for your breeding birds. Egg food should be offered in small quantities, (small enough so the whole amount will be consumed by the birds within two to three hours) very early each and every morning during breeding and rearing. Because hardboiled eggs easily spoil, it goes without saying that any remaining egg food mixture left in the cage needs to be removed. It is most convenient to mix up the egg food and cooked egg and then to freeze it in separate small portions. This makes the whole process of preparing egg food daily much easier. Most breeders have their own secret egg food recipes. Many add additional ingredients. Dried egg food mixed with hard boiled egg provides the basic minimum proteins that must be offered to breeding Gouldians diet. In my e-book, I have included the recipe that I used successfully for years while breeding Gouldians. The Gouldian breeding diet consists of carbohydrates also. In the wild, breeding comes about when insects and sprouting seeds are most readily available. Our domesticated birds have come to accept hard boiled eggs instead of insects for most of their proteins, but not all. Sprouting seeds along with dark leafy green vegetables also contain proteins needed for healthy development. A word of caution, do not use the finch seed mixture that you provide for them as seed for sprouting. There are specific seeds and specific directions for the sprouting of these seeds. You must become informed in order to prevent toxic bacteria from contaminating sprouting seeds. Plan on purchasing the sprouting seed and the equipment needed to sprout seeds safely from a reputable supplier and follow their directions exactly. My e-book contains a thorough list of plant material and vegetables appropriate for your birds diet in order to be certain they have a variety of sources of protein available. Carbohydrates, produced in plants, are needed for energy. Lady Gouldians love to eat the common weed, Chickweed. Since this is not always available, Romaine lettuce or baby spinach leaves are fine substitutes. Fresh greens or sprouted seeds, like fresh egg foods should be supplied early every morning. Remove wilting or soiled greens as you do left over egg food. The remaining needed nutrients, fats, vitamins and minerals are mostly found in sunlight and the seeds we offer our birds. Liquid vitamins and minerals specifically formulated for breeding finches can be added to the drinking water once or twice a week, but if you provide your birds with a variety of foods, it’s questionable if that is necessary. Cuttlebone and ground oyster shells are fine sources for providing the additional calcium needed. Calcium is the one mineral that must be supplemented for successful breeding. Another source of calcium can be found in egg shells. After hard boiling eggs, sterilize the egg shells in the microwave for two to three minutes or boil them again to kill any microorganisms left on them. Let them dry in the sun and then offer them to the birds. Dried and ground egg shells are available at bird shops. When finely ground, calcium can be mixed into moist egg food. If the egg shells are in large enough pieces not to fall through the wire cage floor, it’s fine just to place those cleaned and dried pieces into the cage. Gouldians will nibble away at the egg shells as they need. It is also fine to offer a tiny amount of fish oil and seed in a cup separate from the regular dry seed in your Lady Gouldian Finch Diet. If the ingredients in the fish oil are needed the birds will show an interest in it. Offer this only in very small amounts and very infrequently during breeding. Too much fat or oil could cause a bird to become obese and not a good choice for breeding. Rest assured the birds will select from the foods that are provided to them all the nutrients that their bodies need. It is up to us only to provide a great variety of sources in the Lady Gouldian Finch Diet. Fresh water in clean water bottles is an absolute must for every day. Since Gouldians will forage on the floor of their cages for seed, it’s recommended that the cage you select will be one that will have of a mesh or wire floor with a pull out tray beneath so that the droppings and seed are not simply left on the floor of the cage to, get mixed together, walked in and then eaten. If your cage is not equipped with a fall through bottom, it is necessary that the cage floor be cleaned daily. It is also important to not place feeding cups or dishes directly beneath perches or close to water containers. 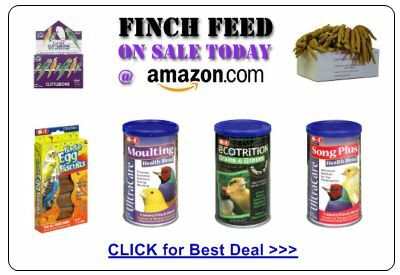 Buying your Lady Gouldian Finch Diet supplies online is not only convenient as it is delivered to your door, but by taking advantage of the savings and discounts that are often offered, you can save a considerable amount of money for your supplies and Lady Gouldian Finch Diet feeding bills.